The Emperor’s Revenge opening line: Lieutenant Pierre Delacroix cursed himself for his over-confidence. With what they think is the best outfitted attack boat, Juan Cabrillo and his crew never expect to be attacked at sea. But chasing their stolen money they come across a yacht with capabilities better than their own. Will they be able to fend off the might of the opposing Captain and recover their stolen wealth? 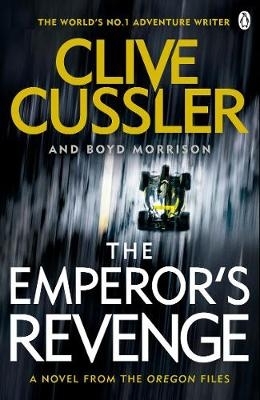 The Emperor’s Revenge is the new action-packed Oregon Files adventure from bestselling author Clive Cussler. A deadly bank heist, a narrow escape and a secret hidden in history that could cripple life as we know it. Juan Cabrillo and the crew of the Oregon face their toughest challenge yet when a violent bank heist during the Monaco Grand Prix decimates the Corporation’s accounts. To get the money back, Juan joins forces with an old friend from his days in the CIA so they can track down a rogue hacker and a ruthless former Ukrainian naval officer. It is only after the hunt begins that the enormity of the plan comes into focus: the bank theft is just the first step in a plot that will result in the deaths of millions and bring the world’s economies to a standstill. The catalyst for the scheme? A stunning document stolen during Napoleon’s disastrous invasion of Russia. But two hundred years later, it may be the thing that brings Europe to its knees. I love the historical suppositions in Clive Cussler’s books and here we are faced with the possibility that Napoleon was spirited away from St Helena. Of course, we will never know if that ever happened but it makes for interesting reading. I battled to get into this book at the start with so many things going on at once. But it was well written and made for a good read. Dave and I are overseas in the United Kingdom. We will be back at work on the 23rd of October. I will start replying to comments then. I won’t be able to read any blogs while we are away so please forgive my lack of visiting back. You can follow our trip by taking a look at our holiday blog. Sounds like a great book Tandy, my husband loves Clive Cussler novels. My husband just finished reading Pirate by Clive Cussler, I’ll have to tell him about this one. Hope you are having a great time on your holiday. An interesting topic for a book, Tandy. Another one for Terence. Wish you could come and fetch them all. I’ve got a huge bag of books ready to be liberated.